Hmmm. That word had been popping up a lot lately. As I stood there on the dock, I thought about some of the miracles that had happened for me through the years–including how I wound up writing this from Florida. Miracles are everywhere. However, they don’t always look so miraculous as they are unfolding. When traveling, I like to visit bookstores and say hello, so I stopped by Barnes & Noble and asked to speak to the manager—we’ll call her Kay. After a brief chat, Kay invited me to do a signing the following week. Now, typically, author events at the big chains—if you can even get one—are scheduled at least two months in advance. None are ever scheduled during the holidays—ever—so the offer was a fantastic surprise. 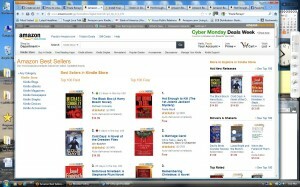 All I had to do was stop by the day before and make sure the books had come in and we were good to go. Woo hoo! As directed, I arrived the day before and asked to speak to Kay. She wasn’t in and “Manager Sue” came to help me. Sue was clearly not happy, but she did admit to being relieved to finally figure out why people had been calling the store asking about a book signing. Oh, this was not sounding good. Sue checked to see if the books had come in—they hadn’t, nor would they ever since that store does not do author events. Never ever. Then Sue gave me the “and even if we did it would never be during the holidays and never at the last minute” speech. I said I understood, but here we were. Perhaps we could give Kay a call and see what her plan had been. Maybe it could still work out okay. And maybe not. Turns out, shortly after talking to me, Kay had been critically injured in an accident and was now recovering in the hospital. (Yikes!) She’s going to be okay—thank goodness!—but there would be no answers or possible fallback plans. So, we decided to just have a “book signing” without books! An odd thing no matter how you look at it–or, maybe a miracle. Now, I don’t know Kay’s story, but I bet it is a good one, and being alive after such a severe injury definitely qualifies as a miracle! And, for whatever reason, she had set a situation in that would ensure my presence in the store from 12-2 pm. I apparently needed to be there, and I couldn’t wait to find out why. I met some really nice people and heard some miraculous stories. Several women told how they’d been pushed to the brink by health crises and had come back transformed with a new sense of purpose and passion. Another woman shared her “impossible” real estate story of how she’d listed her house for sale, sold it and bought another one in a short sale all in the matter of two weeks. Inspiring stories. Inspiring people. Miracles. About an hour into the event, a couple in their mid-fifties walked in, came directly over to me and started chatting. I told them about how Living the Life You Love is for people who know they need to make changes but may not know what to do next. “Jan” and “Stan” looked at each other and said, “That’s for us!” They hadn’t intended to come into the store, but now they knew why they had—they needed that book! A few weeks before, after quitting their jobs and moving to start a new chapter in their lives, Jan and Stan had been walking around with nothing much to do. Noticing a restaurant happy hour sign, they checked the time, and even though they only had five minutes to catch the special, they went in. Only a few steps in the door, Stan had a massive heart attack and fell to the floor. He was dead. A woman sitting nearby, who happened to be a respiratory specialist, began CPR. As “luck” would further have it, a fire truck and ambulance were in the parking lot, and Stan was headed to the hospital in record time. Stan’s doctor told him he’d never spoken to anyone who’d experienced that type of event because no one ever lived to tell about it. Stan’s story became even more miraculous as he shared how an earlier near death experience had played out in a similar fashion, how a multitude of “coincidences” had shaped their path, and how all the events tied together and brought them to that moment. Miracles. My latest personal miracles aren’t of that magnitude, yet for me they are lifesaving in so many ways. 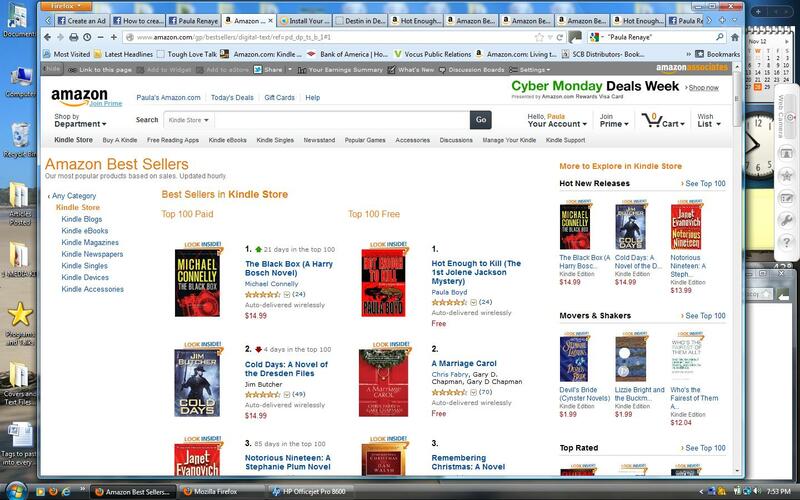 I still don’t know how my mystery novel, Hot Enough to Kill by Paula Boyd, became the number one downloaded ebook in the entire free Kindle store on November 28th, but it did, and nearly 28,000 people now have a copy of it to read. 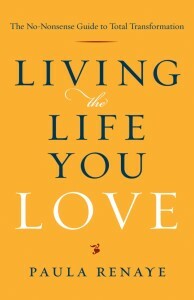 Then, two weeks later, my self-help book, Living the Life You Love, was named to Kirkus Reviews Best of 2012. Miracles! So what about you? What’s your story? What are your miracles? From the smallest “coincidences” to the biggest, totally-impossible wow moments, remember them all. Appreciate them, be grateful and keep looking for more! Paula Renaye is The Tough Love Coach, empowerment speaker and award-winning author of Living the Life You Love: The No-Nonsense Guide to Total Transformation. She is currently living her dreams in Florida and can’t wait to see what miracles occur for her own transformation next! Visit www.ToughLoveTalk.com.